Call it the new kale! Cauliflower used to be just another ho-hum veggie but these days, it’s more like a ninja warrior — slashing carbs and calories in everything from pizza and rice dishes to smoothies and soups. The calorie and carb savings are great, but these swaps provide even more: This veggie supplies 3 grams of fiber and more than half of your daily vitamin C requirements in each 30-calorie cup. It’s also a meaningful source of folate and vitamin K. Even if you’re late to the cauliflower party, these ten nutritionist-approved recipes will have you singing its praises. Call it cauliflower magic: The humble veggie slips into smoothies to add creaminess, but because it adopts the flavors of other ingredients, it doesn’t distract from the great-tasting combo of peanut butter and banana. Move over cauliflower crust. Make room for low-carb cauliflower tortillas. This recipe cuts about 80 calories and 21 grams of blood-sugar spiking refined carbs from your soft taco. If the idea of making your own cauliflower tortillas sounds daunting, don’t worry. If you can press a button on your food processor and flip pancakes, you’ve got this! Cauliflower is a little less sneaky here, but the cleverness comes from tossing it into a main-dish salad instead of relegating it to side dish status. This wintery salad packs plenty of immune-boosting nutrients, like zinc (from lentils) and vitamin C (from cauliflower), so be sure to have it on heavy rotation as cold and flu season sets in. Though there’s nothing wrong with a full-size cauliflower crust pizza, minis give you much more flexibility. You can serve them as appetizers, have one as a snack or have a couple as a meal. No matter which way you go, you can feel good about this totally grain-free crust. How you top these cute crusts is entirely your call! 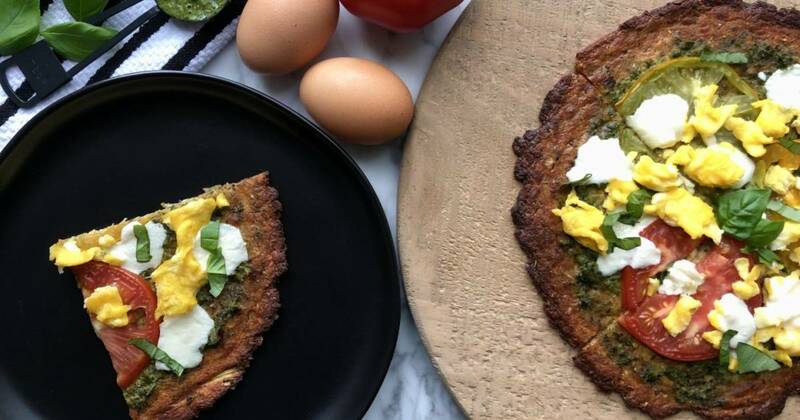 For days when you don’t feel like making your own cauliflower crust (which, let’s face it, is just about every day in my house), this recipe uses a store-bought version. And while it’s called breakfast pizza, it would be just as good (and satisfying) as a balanced lunch or dinner. Seriously, what can’t cauliflower do? Here it’s used as the base of a grain-free dough to create the everything bagel knockoff of your dreams. As you likely know, a typical bagel is full of refined carbohydrate, supplying the equivalent of about four servings of white bread. Skip the post-bagel energy slump and instead, try this 100-calorie cauliflower-based alternative. Get the cream cheese and lox ready! Granted, this is yet another version of the now infamous cauliflower crust, but the clever idea here is cutting it into a breadstick that can be dunked in marinara sauce. If you’re a fan of mozzarella sticks, this is a much healthier dunker that still oozes with cheese. Also, it’s worth mentioning that if you don’t have cauliflower crust confidence yet, this site has an easy how-to video. This salad has all the flavor of your favorite buffalo wings, but it’s clearly a healthier way to go. After coating the cauliflower in a simple batter, it’s baked (not fried) to crispy perfection and then tossed with more veggies for a fun salad. If you want to punch up this vegan salad with more protein, you could add chickpeas. Meat-eaters can toss in some shredded chicken. And if you want to skip the salad and eat the cauliflower buffalo bites as an appetizer or snack, I won’t stop you. There is something really stunning about a whole head of cauliflower and this show-stopping version has a dramatic golden hue thanks to a marinade that includes turmeric and paprika. A quarter of this dish fills you up with almost 7 grams of fiber and 6 grams of protein. The cauliflower is just one healthy upgrade in this comfort food favorite. Other healthier swaps include whole grain macaroni instead of ordinary noodles and Greek yogurt, which adds creaminess without the buttery roux. These upgrades take a dish that is typically a total splurge to a meal that packs in 17 grams of protein, 4 grams of fiber and about 50 percent of both your daily vitamin C and calcium needs. Everyone loves a good before and after story!